Alzheimer’s disease (AD) is the most common neurodegenerative disease, and is clinically characterized by cognitive disturbances and the accumulation of the amyloid β (Aβ) peptides in plaques in the brain. Recent studies have shown the links between AD and the immediate-early gene Arc (activity-regulated cytoskeleton-associated protein), involved in synaptic plasticity and memory consolidation. For example, AD mouse models show a decreased expression of Arc mRNA in the brain. In additional, acute Aβ application to brain slices leads to a widespread ARC protein diffusion, unlike the normal defined localization to synapses. In this study, we investigated genetic variation in human ARC and the risk of developing AD. To this end, we genotyped 713 subjects diagnosed with AD and 841 controls without dementia. ARC was sequenced in a group of healthy individuals, and seven previously known SNPs and three novel SNPs were identified. Two of the newly found SNPs were intronic and one, +2852(G/A), was located in the 3′UTR. Three tag SNPs were selected, including the novel SNP +2852(G/A), to relate to risk of AD, Mini Mental State Examination (MMSE) scores and cerebrospinal fluid (CSF) biomarker levels of total tau (T-tau), hyperphosphorylated tau181 (P-tau181) and Aβ1–42. The AA genotype of the newly found 3′-UTR SNP +2852(A/G), was associated with a decreased risk of AD (p c = 0.005; OR = 0.74; 95 % CI: 0.61–0.89). No associations of single SNPs or haplotypes with MMSE score or CSF biomarkers were found. Here we report a novel ARC SNP associated with a reduced risk of developing AD. To our knowledge, this is the first study associating a gene variant of ARC with any disease. The location of the SNP within the 3′UTR indicates that dendritic targeting of ARC mRNA could be involved in the molecular mechanisms underlying this protective function. However, further investigation of the importance of this SNP for ARC function, ARC processing and the pathology of AD is needed. S. Landgren and M. von Otter contributed equally to this work. 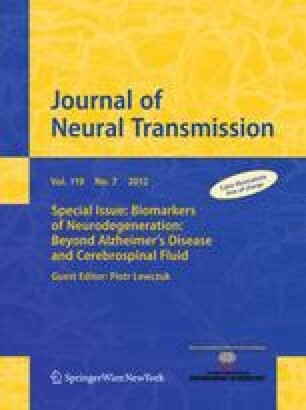 This work was supported by grants from the Swedish Research Council, the Söderberg Foundation, the Swedish Society for Medical Research, the Sahlgrenska University Hospital, the Göteborg Medical Society, Swedish Brain Power, Hjalmar Svenssons forskningsfond, Stiftelsen för Gamla Tjänarinnor, Alzheimerfonden, the Swedish Brain Foundation (Hjärnfonden) and the Seventh Framework Programme (FP7).